The Capsicum genus includes chile peppers, bell peppers, and paprika. 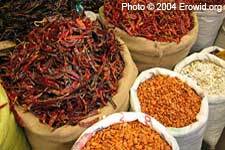 Several species have been cultivated in Mexico for thousands of years as spices, foods, and medicines. A number of plants in the genus contain the chemical capsaicin, which produces the burning sensation associated with spicy foods. The Fascinating World of the Nightshades, by Charles B. Heiser, Jr.